Last week we posted seven of Raichlen’s predictions for barbecue trends in 2017. Here are six more exciting trends. New steaks: This one pops up on my list every year, but the truth is, in our insatiable appetite for beef, we keep discovering (or rediscovering) new steaks. Had your fill of T-bones and rib-eyes? Make way for baseball steaks, Vegas strips, and spinalis dorsi, aka rib-eye cap, and more. Big flavor and an even bigger break on the price. Check out our two-part series here and here. Tomahawk everything: You’ve heard of the tomahawk steak (a rib steak with the meat trimmed and the full rib bone attached, so it looks like a hatchet). 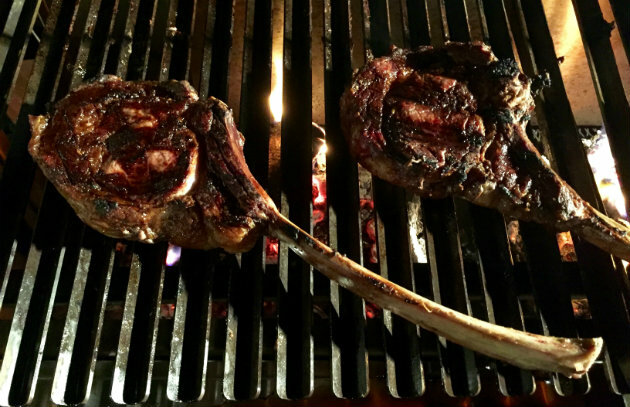 In the coming year, look for tomahawk veal chops and tomahawk pork chops. Can tomahawk lamb chops be far behind? Veggie “steaks”: Last year, my longtime publisher Workman brought out a terrific book called The Vegetable Butcher. I’m not suggesting you go vegetarian on me (I’m married to one), but the book does underline the newfound love chefs and pit masters are showing vegetables. Wood-grilled sweet and sour cabbage at the new Fi’lia restaurant in Miami, not to mention the whole ember-roasted cabbage served at Charcoal in Venice, Los Angeles. Beets roasted in the ashes just about anywhere. To get a jump on your vegetable skills, click here. Almond wood: Hickory? Been there. Apple wood? Old school. The hot new wood for grilling is almond. That’s what they burn at Otium in Los Angeles and Cassia in Santa Monica. (Hey, they grow a lot of almond trees in California.) Almond wood burns hot and clean, producing a bright and elegant smoke flavor. Perfect for grilling and smoking and especially well suited to veal, poultry, and seafood. New uses for salt slabs: Salt slab grilling hit the barbecue world big time last year, and that trend will only get bigger in 2017. Not just grilling on a salt slab (although it makes a pretty amazing squash). How about grilling under a salt slab to make the world’s best pollo al mattone (Italian-style brick chicken)? 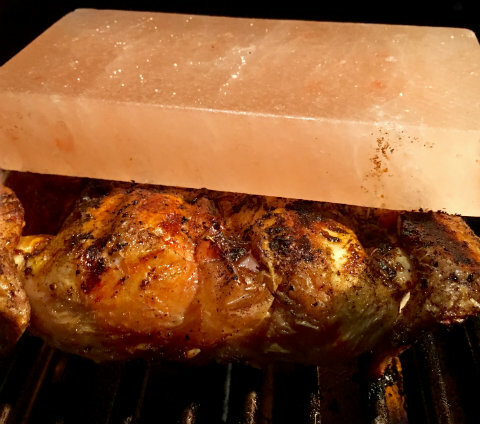 Do you have a cool new use for salt slabs on the grill? Share it with us on the Barbecue Board or on my Facebook page. New flavors: Move over paprika and cumin. Make way for shichimi togarashi and gochujang. The first is a Japanese spice blend typically made with chile pepper, sansho pepper, black and white sesame seeds, hemp seed, orange peel, and crumbled nori seaweed. (It’s awesome on grilled beef.) The second is a sweet-salty-spicy Korean spice paste made with ground chiles and sticky rice. (Slather it on a pork shoulder to make incredible Korean pulled pork.) Other flavors that will be big in 2017? Nam pla (Vietnamese fish sauce—try Red Boat’s bourbon barrel-aged fish sauce). Vadouvan (a curry-like seasoning from India). Fresh and dried spruce from Alaska and Canada. Its fresh piney flavor makes a terrific finishing salt. And charcoal and ash. Click here for Barbecue Trends for 2017, Part 1.